There’s one thing I really don’t like about almond butter: It’s expensive. Actually… I only need a spoon. And my glass of almond butter. That’s it. So here’s the good message: You can make your own almond butter! All you need is a food processor or a heavy duty blender. It’s as good and as creamy as the store bought one. Trust me. I know what I’m talking about! Make your own almond butter! Now the interesting part: Roast your almonds in the oven for about 10 minutes (350F). Be careful not to burn. Let them cool a little bit (it’s works better when they are still a little warm, so don’t let them cool down completely). Put them in your food processor or blender and mix! If you use a food processor, you have to stop and scratch the sides several times, until it’s creamy. Be patient. If you use a heavy duty blender, like a vita-mix (that’s what I use! ), push the almonds into the knife with your tamper. 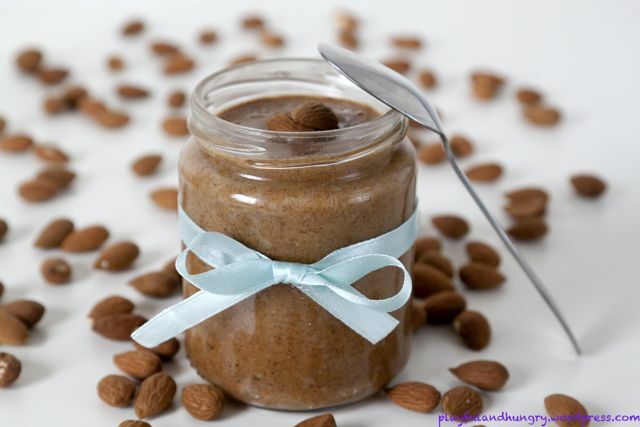 It won’t be long until you have a creamy, yummy almond butter! If you feel like it’s not creamy enough, feel free to add one tsp native oil, like almond oil or walnut oil. This could happen when the almonds are a little older. Creamy Almond Butter. You can’t imagine how excited I was when I finally got my vita-mix and could start making my own almond butter! haha yess! 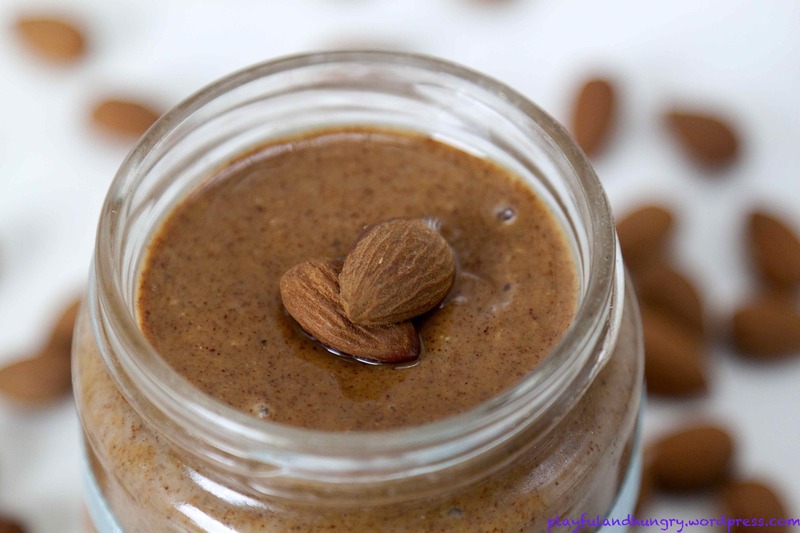 almond butter is pure awesomeness in a jar :D beautiful photos! Aw, that you! Awesomeness in a jar – that’s it! Exactly! We recently got a vita-mix, but haven’t had a chance to make nut butters yet. We’re thinking about chocolate-hazelnut butter. . .
that would be like nutella… just so much better! I just got a NutriBlend and they have a recipe for almond butter in it (not that you need a recipe… it’s just almonds!) I am SO excited to make some!!! I’m not fond of store bought almond butter but homemade is SO much better! I put in a little vanilla and cinnamon. Try it! I love the creativity of your blog- it’s quite cute! And of course, this almond butter looks amazing! This is great! I’ve had the same issue with almond butter — and I love the idea of making it myself! What kind of coconut shreds did you use and what blender? Did it just turn into some kind of “flour”? Looks so tempting. I am a huge fan and is almond butter often in my vegan cookies. Looking forward to making my own…thanks! And thanks as well for stopping by my blog! I will be trying this – never thought to lightly roast the almonds before smooshing them. I bet it brings out the delicious almondy flavour! Yummy! I have Vita-Mix envy. :-) Long ago I used to make my own nut/seed butters. Right now I don’t have a blender or food processor, so I need to buy something. Both nut and seed butters have not only gotten crazy expensive, but it’s almost impossible to find sunflower butter (which I love) without sugar. I have to avoid sugar like the plague due to my hypoglycemia. It’s easy and so yummy! If you are not sure about your food processor, definitelly don’t try raw almond butter first. Toasting the almonds makes things easier for your food processor. You can also add about one tbsp of oil if the almond butter doesn’t get smooth enough. Yum! I always make raw almond butter and recently discovered a tasty addition. Occasionally I’ll add a pinch of salt to the almond butter as it’s mixing. It tends to augment the flavour of the almonds a bit. I love the lego theme of your blog posts- so cute. Hello: Just wanted to drop by and say thank you for visiting my website. I love the little jars in the pics. Pretty neat. This sounds so good! You’re totally right – almond butter costs a fortune compared to buying bulk raw almonds from Costco. I don’t have a food processor or a vitamix, sadly, but I’m hoping that if I roast the almonds and add enough oil that I can do this with my Magic Bullet. It’s worth a try! Yum. This looks beautiful! I’ve never made almond butter before but do buy it frequently (along with sunflower seed butter), and yes, it’s frightfully expensive! A one ingredient recipe sounds excellent to me. Have bookmarked it. Love almond butter, so I will be making this. ok great,,,i just got my vitamix and i’m still playing with it..yeah!! 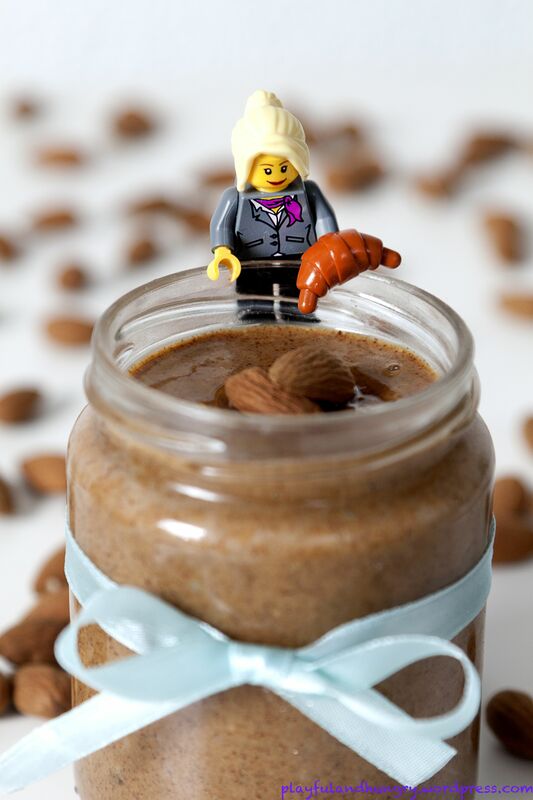 This recipe looks wonderful- and the Lego croissant diver is an awesome touch!